Ability Text: Put nine +1/+1 counters on target land you control. It becomes a legendary 0/0 Elemental creature with haste named Vitu-Ghazi. It's still a land. 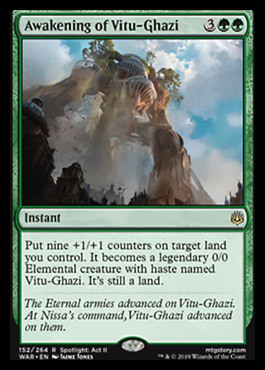 Flavor Text: The eternal armies advanced on Vitu-Ghazi. At Nissa's command, Vitu-Ghazi advanced on them.